Here is a description of the "Abeltjeshuis" at Bourtange in the Netherlands. 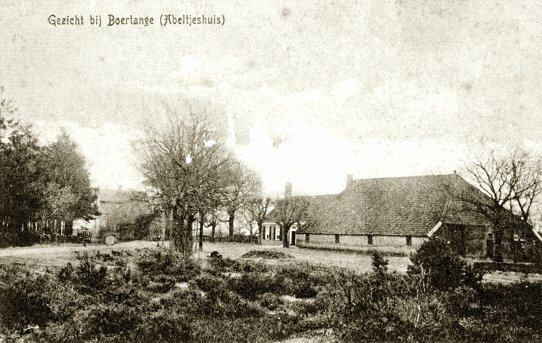 It was an inn berween the fortress of Bourtange and the German border. As far as I know ther is no relation with Abeln. It shows that in the German-Dutch region Abel was a common name. In 1743 in a meeting of delegations of de Staten of the Netherlands and Representatives of the Munstersche and Ceulse area (now Emsland) there was a talk about the "huys Abelties". A limit (border separation) was determined, which lay behind the huijs Abelties. That was the border between the Netherlands and Münster. It was also an appointment to where one should cultivate yes or no buckwheat. The huijs Abelties was in that time not more than a simple house. But it became a well-known spot nevertheless as a farm inn "Het Abeltjeshuis". Solitary it was, outside the fortress Bourtange. On a slope high above the marsh. A bit mysteriously. It offered a safe shelter for late travellers. After severe wintry excursions one found there around fires a warm spot and no wonder which then tales were told. The House was enormous in its dimensions. The guestrooms were so large that in wintertime two huge fires were needed to keep it comfortable. The border ran by of the guestrooms: a paradise for smugglers if the tales contain truth. if one spoke concerning the Abeltjeshuis, also then it for a long time not if inn did service, but more ordinary although enormously large farm was of the family van Hateren. By war violence it disappeared. Only the old trees remained and reminds us to that "Hujs Abelties" from 1743.